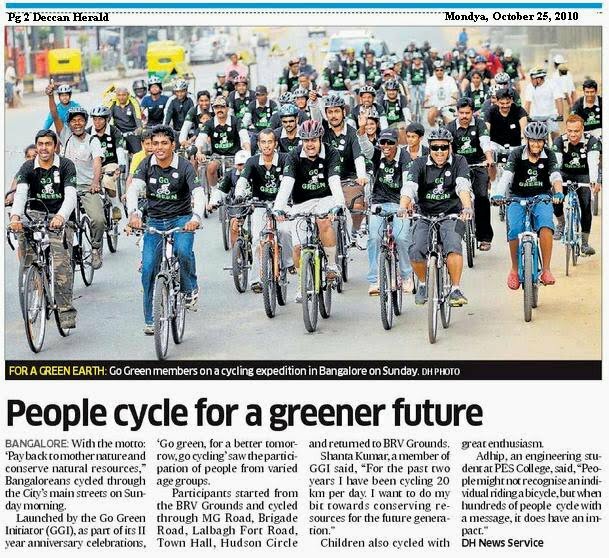 [ ] GoGreen in News & Media - GGI-Group size: 4000+ Professionals, Increasing on day to day basis, Come & join us 2 serve Mother Nature. 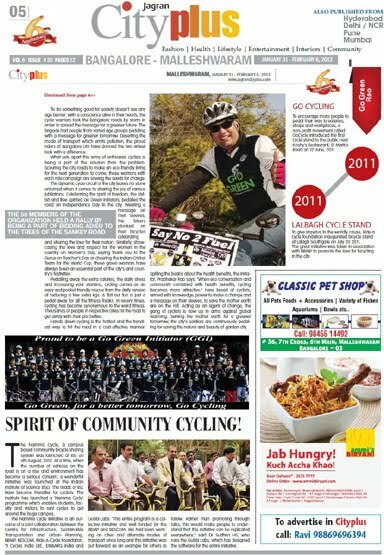 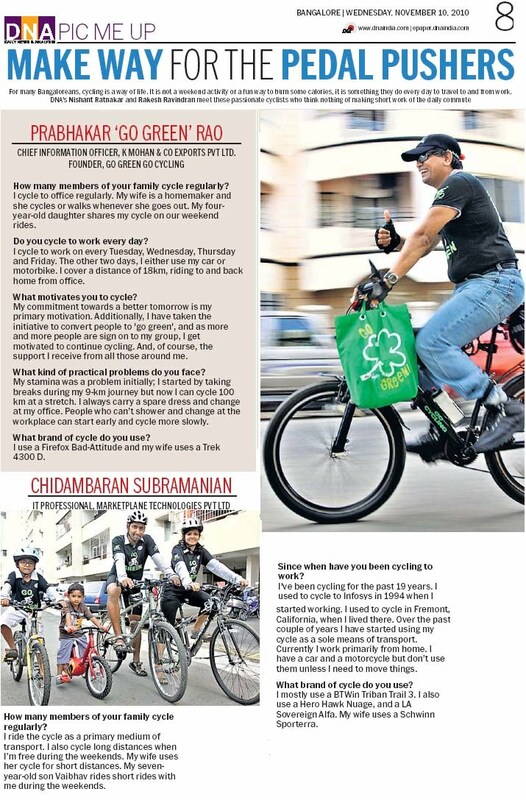 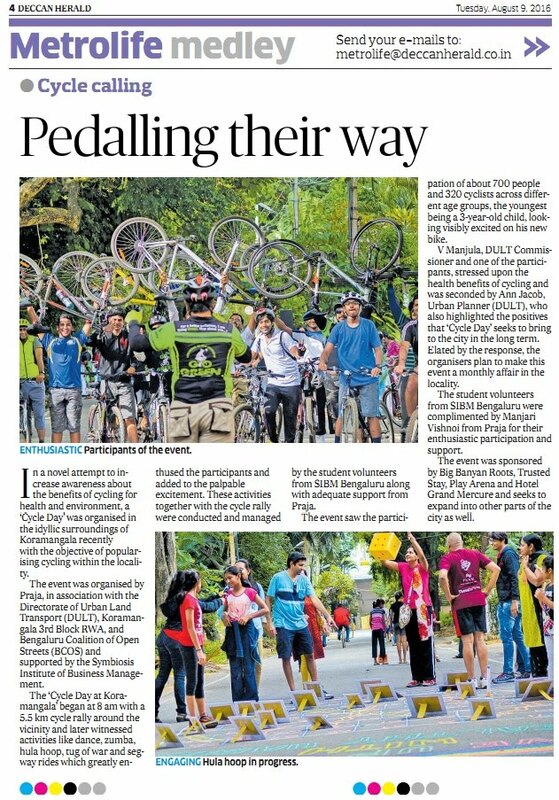 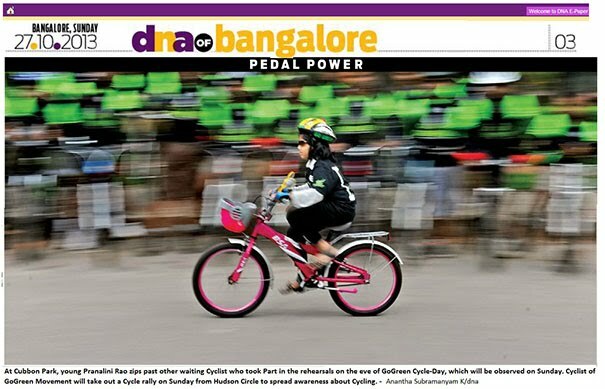 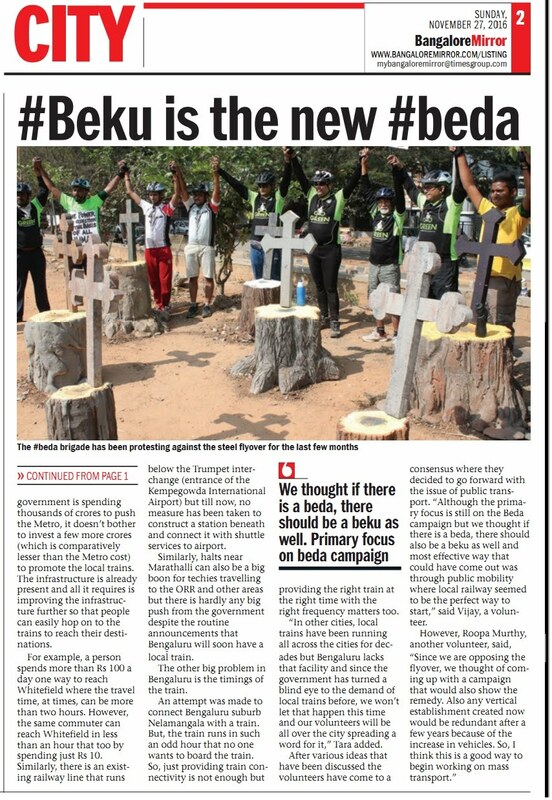 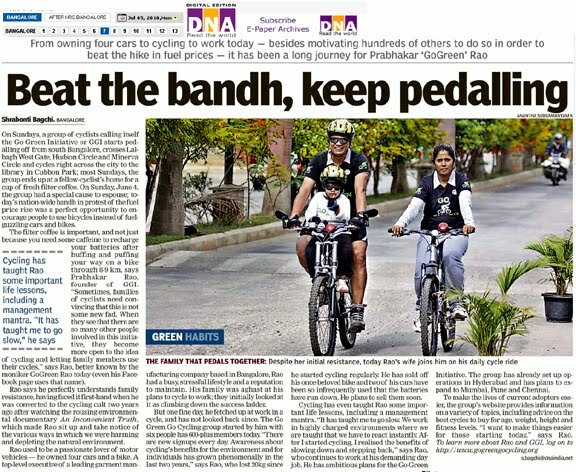 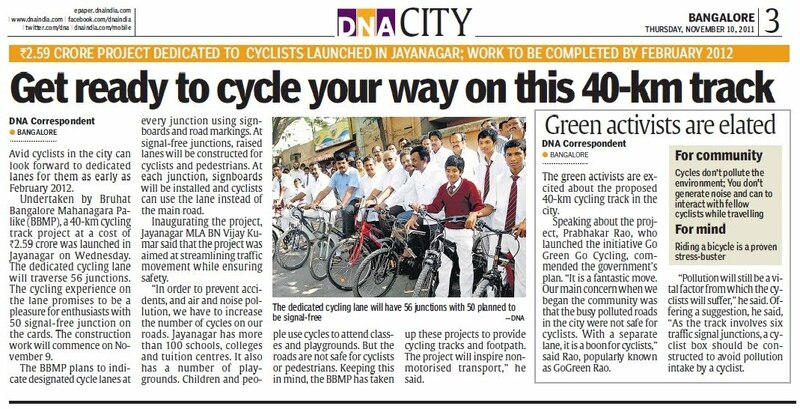 22Apr13, "Cheers to Cycling" covered by DNA. 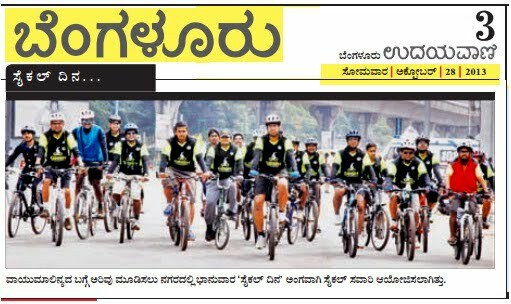 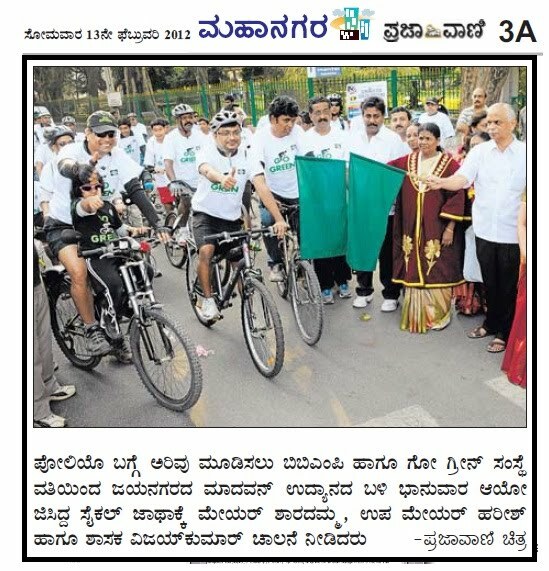 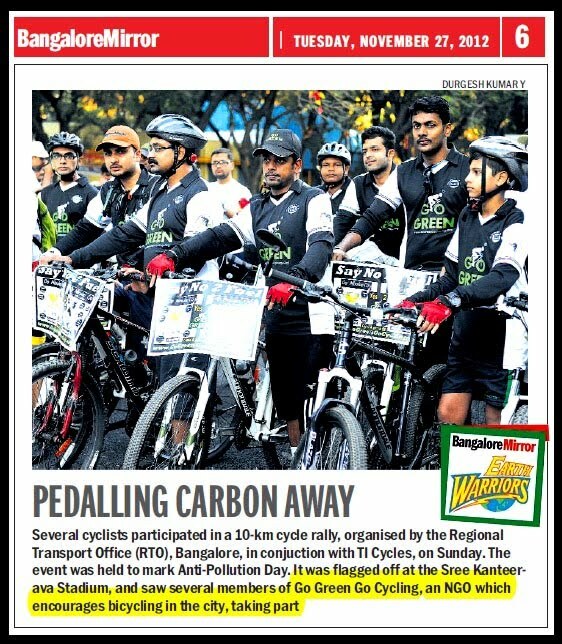 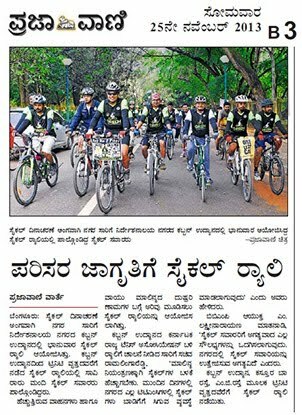 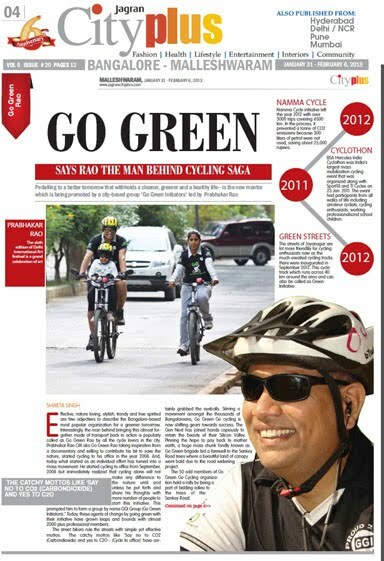 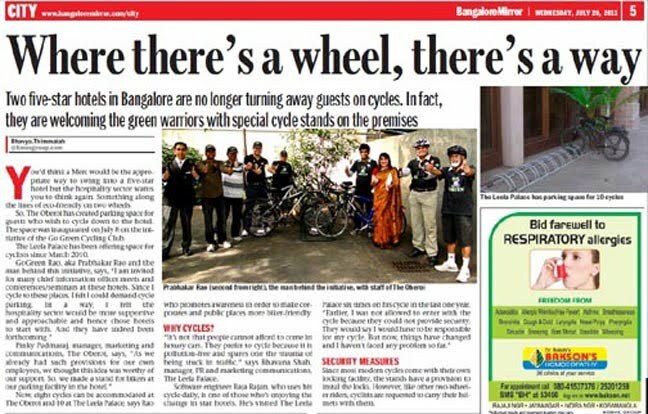 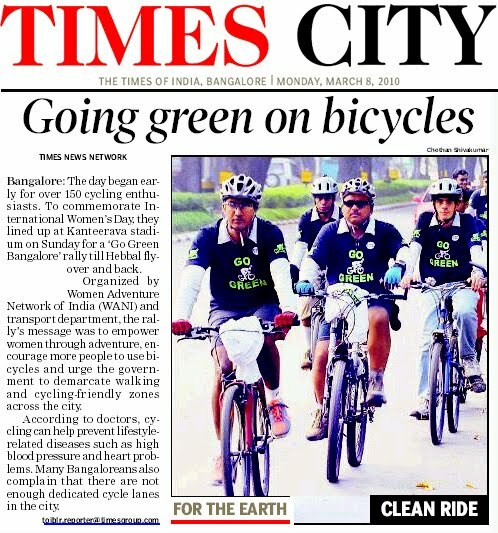 27Nov12, GoGreen's "Say no to Pollution ride" covered by B'lore Mirror. 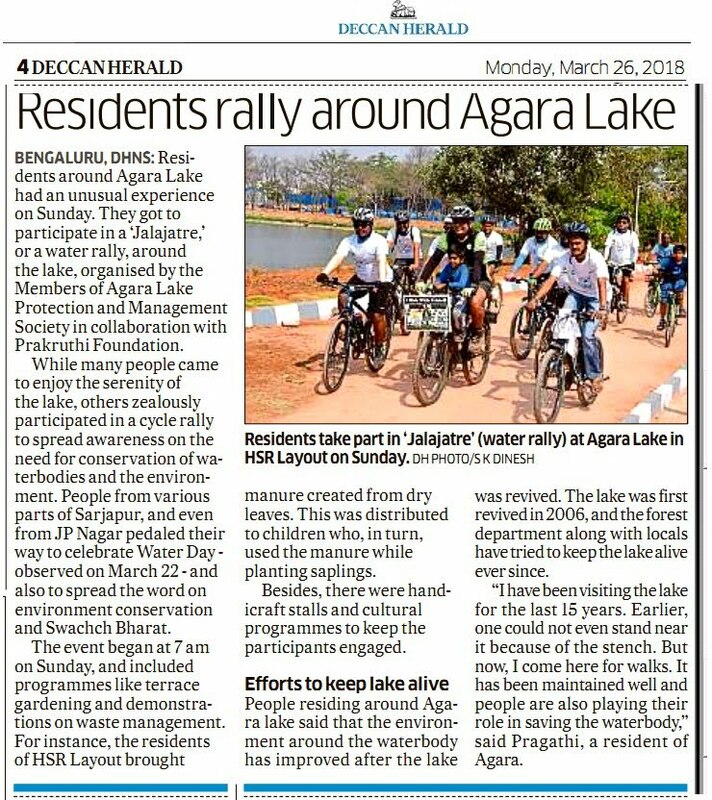 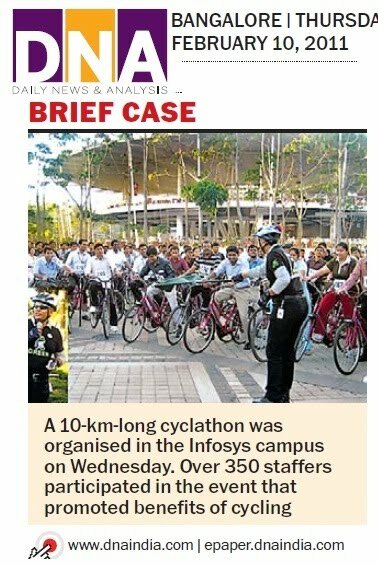 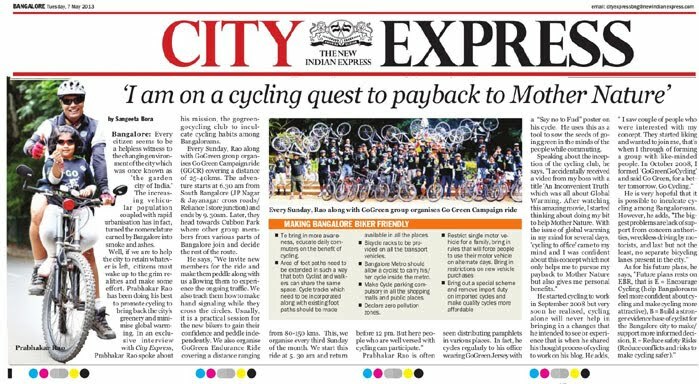 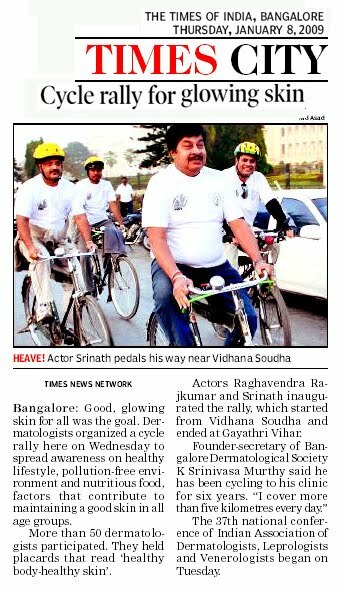 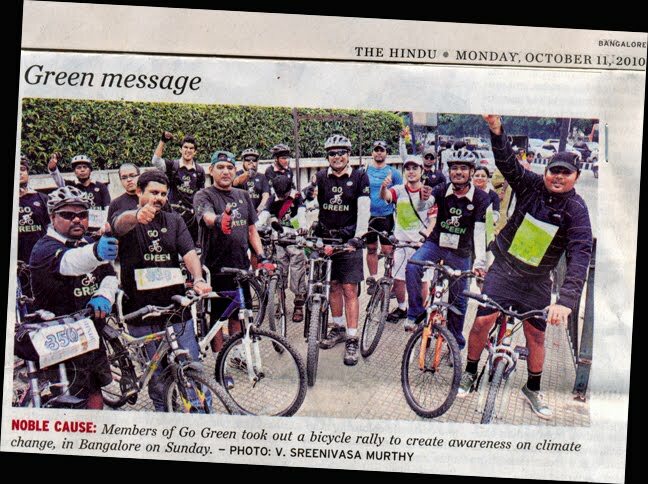 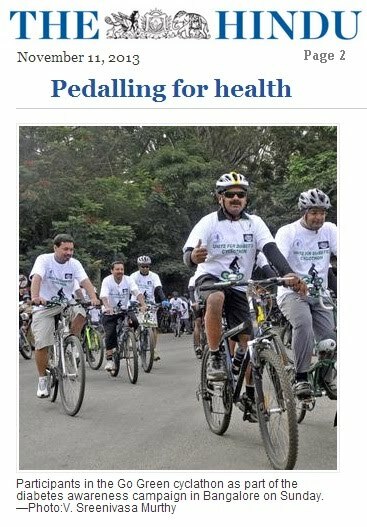 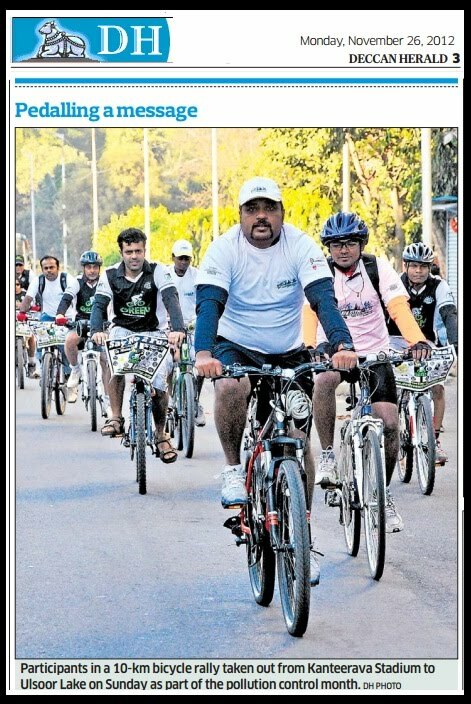 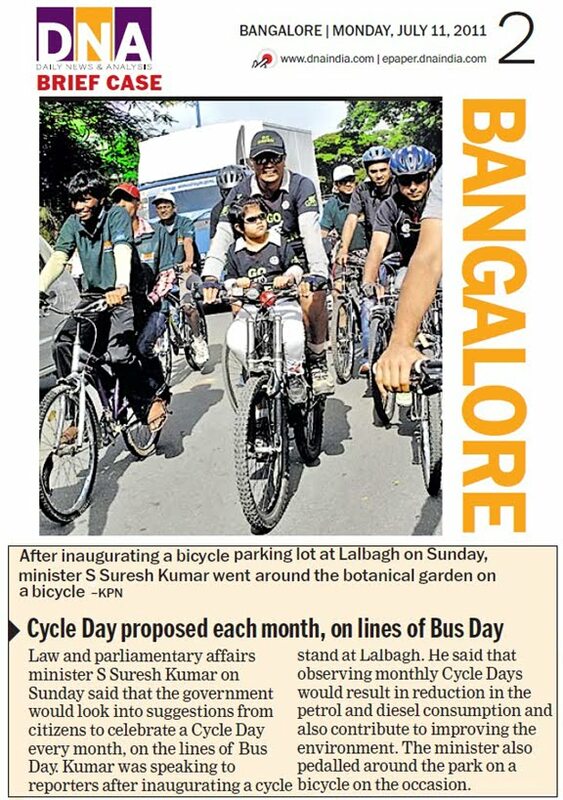 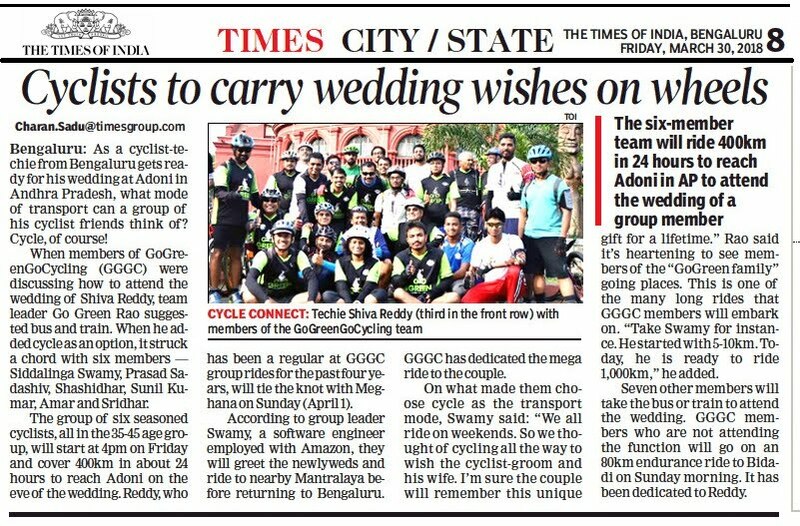 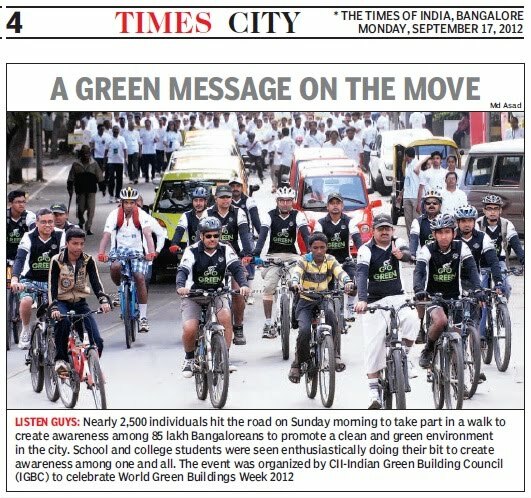 15 Aug 2012, Times of India covered our GoGreen Independence day Ride..
23 April 2012, Deccan Herald Hubli covered our Cycle Rally held @ Hubli. 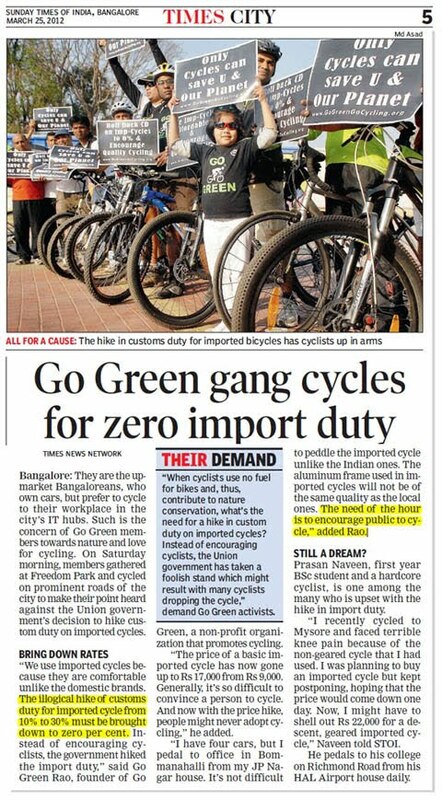 25 Mar 2012, Times of India covered our Protest on CD Rollback. 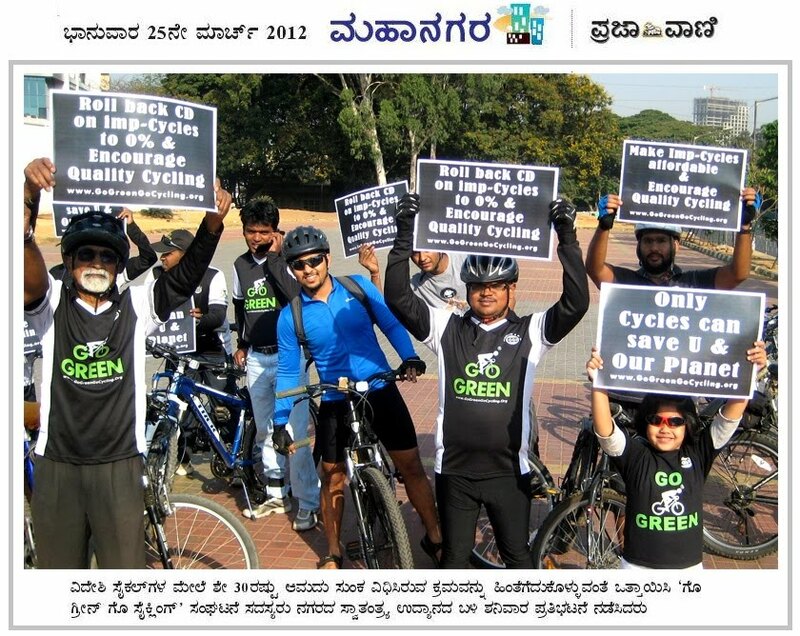 25Mar12, Local Kanannada news Paper covered our protest on CD Rollback. 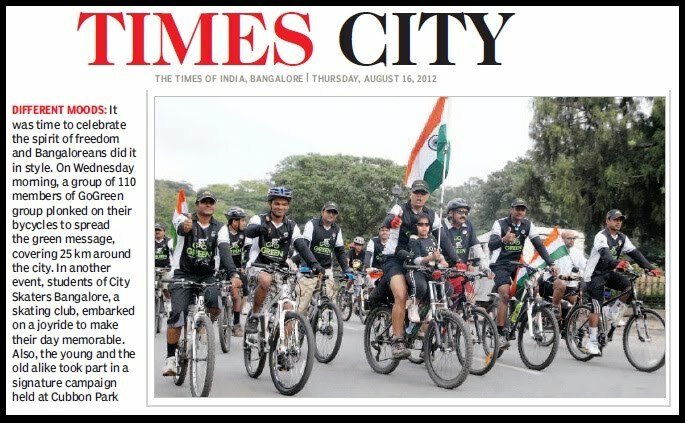 All about Cycling 860 kms in 8 days..
and help to bring the awarness.. 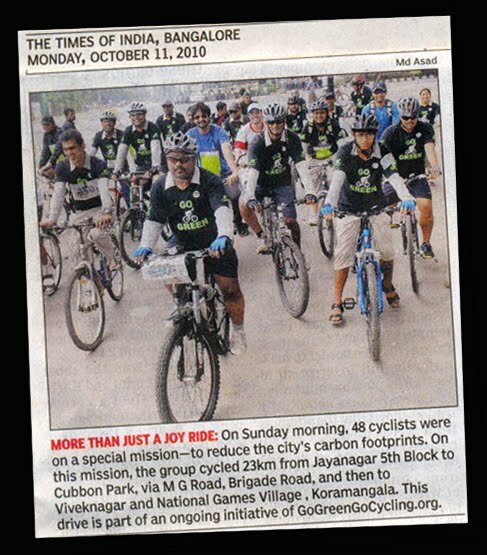 Published by Times 07 December 2011. 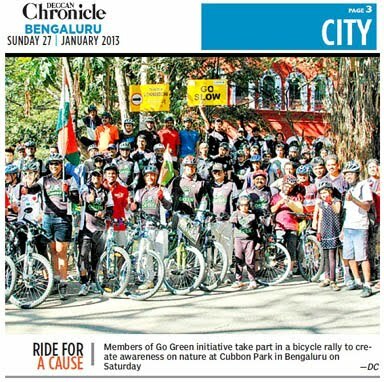 GoGreen cycling rally, bidding farewell for all the lovely trees on Sanky Rd. 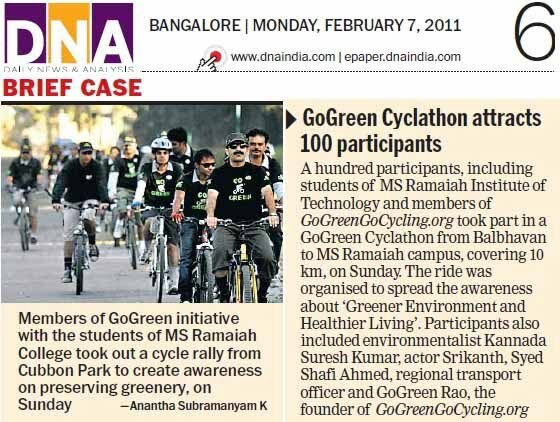 Covered by Local news paper E-Sanjaya on 04 December 2011. 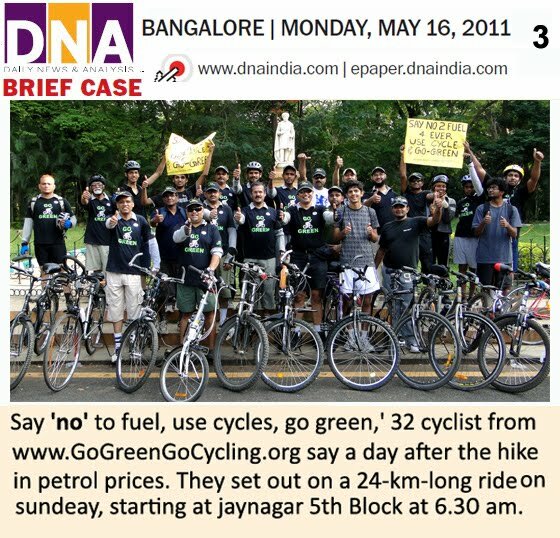 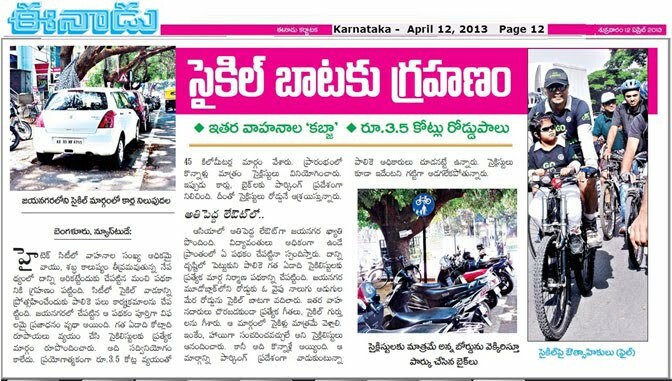 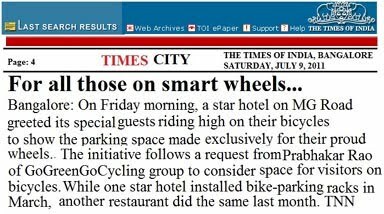 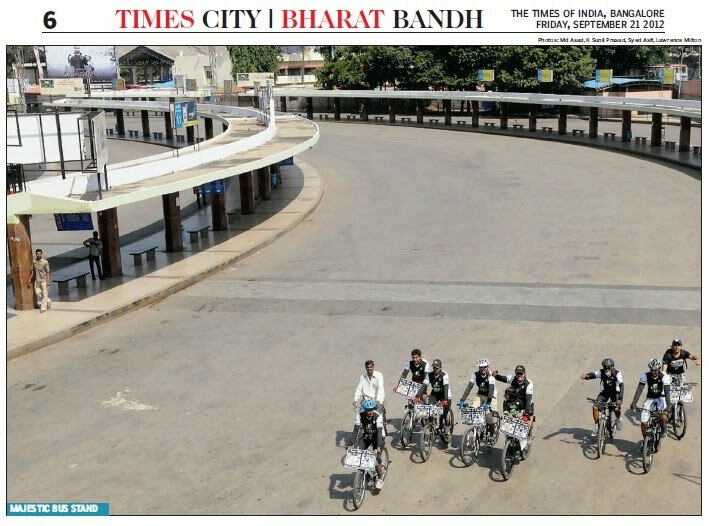 A report on Cycle parking.. July 9th, Pg 4, Times of India..
"Say No to Fuel" Special ride on 15May2011. 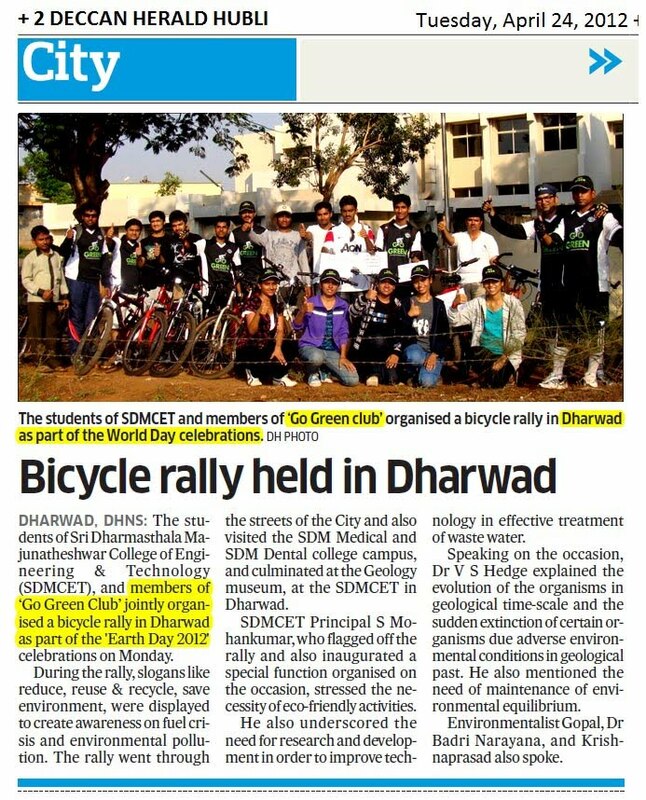 DNA News Listed our event. 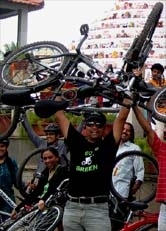 GoGreen Team cheering Indian Team 4 world cup. 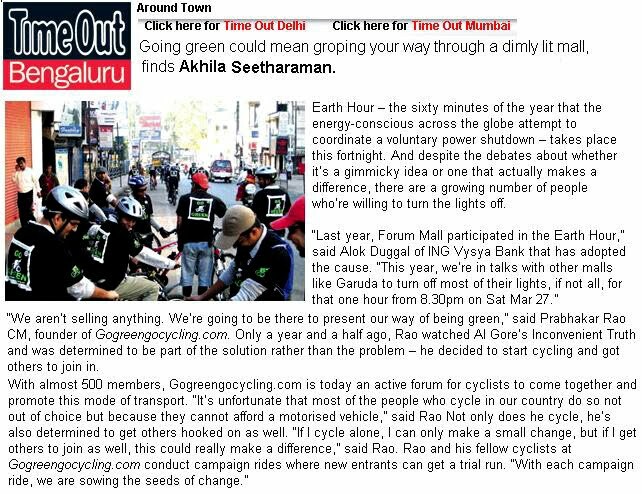 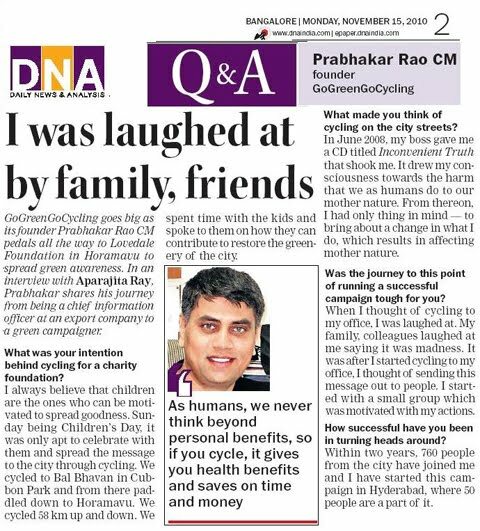 DNA News Article (Bangalore edition Pg-2) Q&A with Go Green Rao. .
on Go Green Special Ride on 10/10/10 to reduce Carbon foot print. 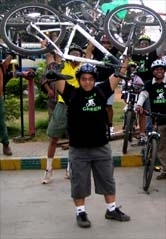 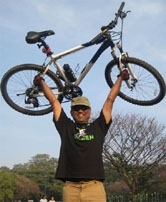 Go Green Special Ride on 10/10/10 to reduce Carbon foot print. 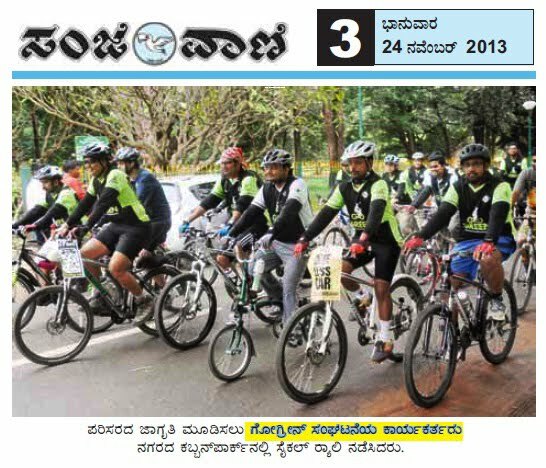 by TV-9, a local kannada TV Channel. 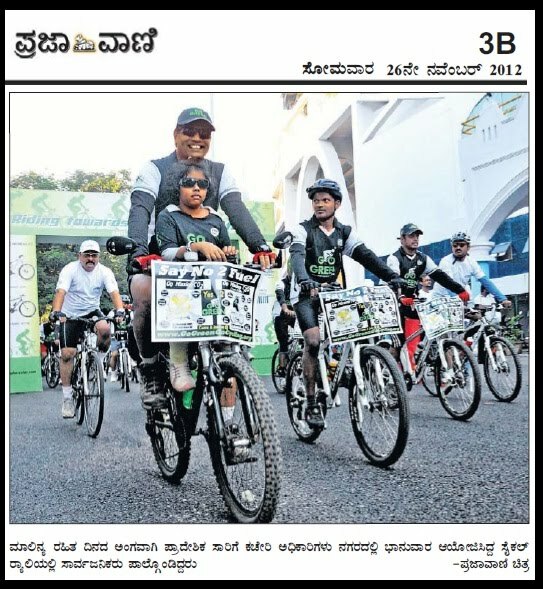 Initiative, featuered by Kasturi, a local kannada TV Channel.